In addition to promoting bike-friendly on-road conditions, Ride Illinois also advocates for more off-road trails to be built along roads and on their own rights-of-way. Each year, Ride Illinois heads the Illinois delegation to the League of American Bicyclists’ National Bike Summit. There, we visit our state’s Congressional offices to help lobby for favorable federal policies such as the Transportation Alternatives Program (TAP), which has funded most of the new bikeways in Illinois and the country since 1991. Ride Illinois serves as a monitor of how TAP and other federal bikeway dollars are distributed in the state. Our vigilance and advocacy has directly saved tens of millions of dollars, which are being used to build more trails all around Illinois. 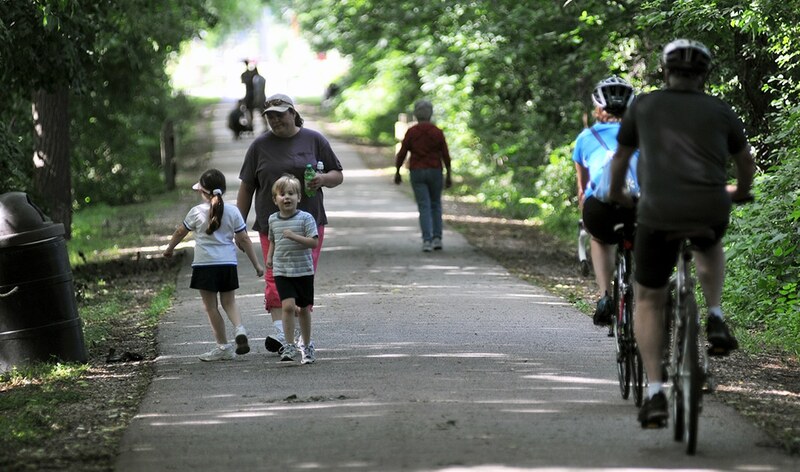 We advocate for state funding of trails and maintenance of the state trail system. Ride Illinois advises local agencies on grant strategies, helping them access the external grant funding sources above, for their particular trail project. We also have expertise in raising funds from the community to pay a grant’s local match or fund the trail entirely. Trail development sometimes leads to opposition from adjacent residents. We can help trail-building agencies learn the facts to calm concerns about trails’ effect on crime, property values, etc.